Cuba's capital city truly must have been one of the finest cities in the Americas in its day. Compared with many Caribbean ports of call, whose historic structures are limited to a handful of churches and musty museums, Havana and its nod to culture and history are breathtaking. It still boasts thousands of architectural treasures, dozens of top-notch museums, gracious avenues and promenades, wonderful music, friendly people, breathtaking vistas and more. However, the city is rich with rewards for visitors. The core of "Old Havana" or "La Habana Vieja" is a treasure trove of architectural gems. Across Havana Bay, the iconic 16th-century Castillo del Morro (Morro Castle) guards the city and the harbor and provides panoramic views. 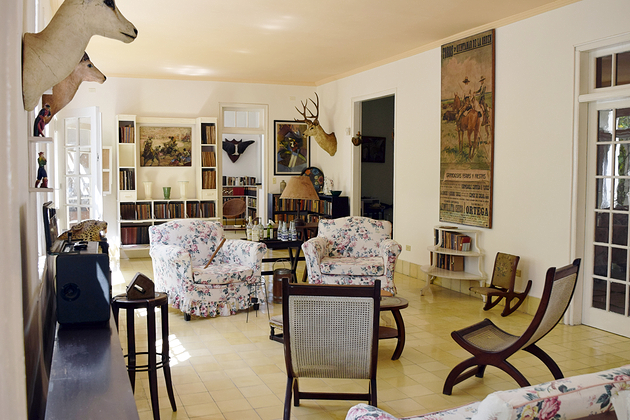 The graceful and elegant avenues and mansions of "El Vedado" offer a glimpse of a wealthy past. Today, it's also the center of the modern government at the symbolic Plaza de la Revolucion. Cuba was discovered by Christopher Columbus in 1492 and was key in colonial times for its strategic location and rich agricultural base, which developed into the world's foremost sugar industry. (Today, it's almost extinct.) Havana itself was founded by Diego Velazquez in 1514, and, with its sheltered harbor, it prospered for centuries as a key center for trade. 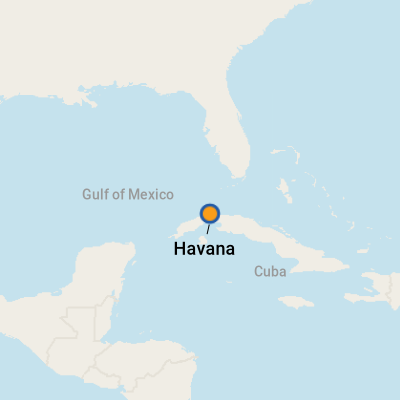 The United States' embargo on Cuba, which began in the 1960s and has been modified several times, once prohibited U.S. citizens and U.S. companies from conducting business with Cuban interests. In 1999, U.S. President Bill Clinton modified the embargo to prohibit subsidiaries of U.S. companies from doing business in Cuba, and he also authorized the sale of certain specific products to Cuba. 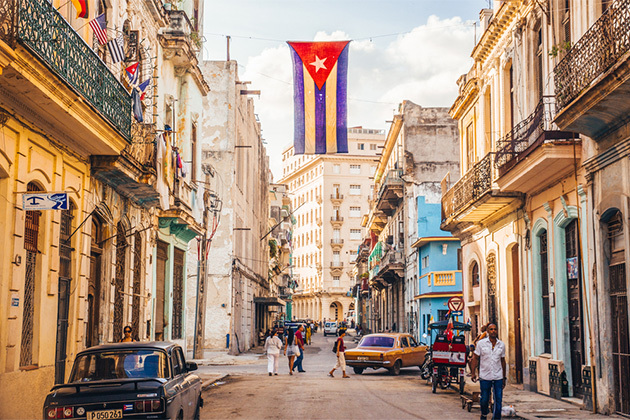 More recently, President Barack Obama eased travel restrictions to Cuba, starting with those of Cuban descent and eventually allowing all citizens to visit with the ability to self-certify the cultural requirements to do so. Under the Trump administration, the certification required by U.S. citizens in order to visit is back to a group tour mandate -- but the regulations are a moving target. The island remained politically aligned and economically dependent on the Soviet Union until the 1989 fall of the Berlin Wall and the subsequent collapse of Communism in Eastern Europe. 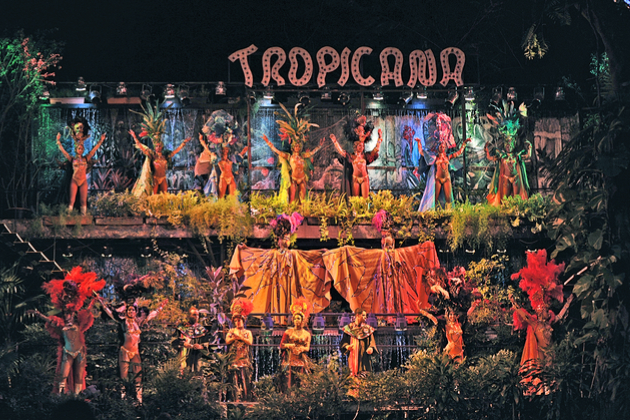 Following difficult economic times in the early 1990s (known as the "Periodo Especial"), Castro's regime began encouraging foreign investment, resulting in increased tourism -- predominantly from Canada and Europe. This marked the beginning of capitalism and renewed opportunity for the Cuban people. Cuba now attracts more than two million visitors each year. In 2008, because of Castro's failing health, his brother Raul Castro was named president. Raul Castro has introduced changes to the island, such as allowing ownership of cellphones, buying and selling property and private enterprise, most notably in the form of paladars, or private restaurants. Fidel Castro died eight years later, in 2016. With its convenient location, just 90 miles from South Florida, Cuba is an ideal port of call for lines sailing Caribbean itineraries. 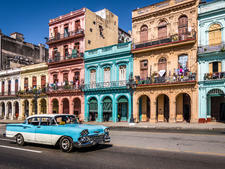 Now, due to a slow thaw, U.S. citizens are able to cruise to Cuba contingent upon taking a tour that falls under the cultural outreach visa category of people-to-people travel. These approved tours are offered through the cruise lines, and since restrictions loosened in 2016, they are heading to the once-forbidden island in droves. U.S.-based lines that now regularly call on Cuba include Carnival, Norwegian, Royal Caribbean, Oceania, Azamara, Holland America and Viking. Cruise ships dock at Terminal Sierra Maestra, and it's surprisingly modern inside. Since the cruise terminal is so centrally located (opposite Plaza de San Francisco in the old town), there's no reason to hang around the facility. The small souvenir shop on the first floor -- once selling only Cuban music CDs and postcards -- has upgraded to cigars and rum, if you need to grab something before your ship leaves. The terminal is also the best place to exchange your currency over to the CUC; just be sure to change any unwanted pesos back to dollars before the counter closes -- typically around 8 p.m.
Havana is a peaceful and safe city. That being said, take precautions against pickpockets and petty crimes: Do not wear lots of jewelry; avoid handling cash in plain view; keep valuables safe or, better yet, on the ship. There are no beggars as such, but you might encounter hassles from so-called jiniteros, who are young men who will follow tourists and offer them anything from taxis to girls to a ubiquitous "cigar sale" (depending on your inclination). The best advice is a firm no, and they will move away to hassle someone else. In many plaza and tourist areas, men and women dress in local costumes and ask for change in exchange for having their photos taken. In addition, be careful of those trying to sell cigars and rum on the streets. Often, the products are fake or of an inferior quality. In addition, because of restrictions on locals changing currency, be wary of those asking to exchange money. The currency they try to exchange with you may be counterfeit. Prostitution is rampant in Havana and completely in your face, but it is illegal. And, be warned that the government is not tolerant of any guns or drugs, so buying even a tiny bit of marijuana can lead to significant trouble with the law. By Taxi: Official taxis are metered and widely available at a number of taxi stands throughout the city. Official taxi services feature newer vehicles with official taxi logos on the side, uniformed drivers and, usually, air-conditioning. An hourly price of about 10 to 15 CUC can be negotiated with drivers. Numerous unofficial taxis are not metered or insured. Be sure to negotiate a price in advance. Also note that similar to Uber Pool in the States, some of these older taxis can fit a surprising amount of people inside; it reduces the rate and might spark a new friendship, but is maybe not the most comfortable way to travel. By Classic Car: In addition to taxis (and a lot more fun), you can hail one of the vintage cars, which in recent years have become official taxis. The rate is the same, and if you can put up with the split leather seats and heat (many are open-air), they are a much more interesting way to see the city. This is a must-do while in Havana -- the range of these classic American vehicles is staggering, and owners treat the cars -- passed down from generation to generation -- as a family member. After all, this is a primary source of income for many in the city. By CocoTaxi: These bright yellow, three-wheeled, open-air vehicles carry two passengers and the driver. They are a fun alternative for short trips, but they aren't metered, so be sure to establish a price in advance. You'll also find more standard pedi-cabs if you're not interested in riding inside what appears to be a lemon. Two currencies circulate in Cuba. The peso nacional, or peso Cubano (CUP), is used by locals and is virtually worthless to tourists (except for use in public phones, local buses and some cinemas). The peso convertible (CUC) is currency used by tourists, and you can buy just about everything with it. It is pegged to the U.S. dollar, but note when you exchange it at the official exchange bureau, they will take a 10 percent commission. U.S. dollars are the only currency subject to the commission, and so you are better off bringing euros, British pounds or Canadian dollars. Also important to note that you can't buy Cuban currency before you leave the States, and it can't be exchanged back once you return. Credit and debit cards and traveler's checks issued by U.S. banks are not accepted in Cuba, and other credit cards incur transaction fees of between 7 and 11 percent. Some establishments will accept Canadian dollars or euros. Money can be exchanged at official Casa de Cambio (CADECA) locations throughout the city and at the airport. Check online before your visit for current exchange rates. Spanish is the official language, although many in the tourist industry speak some English. Until fairly recently, eating in Havana could be a bit of a challenge, because of the lack of quality and inconsistency of ingredients. Most restaurants were state run (and were generally pretty awful both in terms of food and service). The few privately run restaurants (known as paladars) were subject to a slew of red tape that made them almost as bad as the state-run ones. All of this changed in January 2011, when President Raul Castro's new privatization laws allowed paladars to seat up to 50 people (previously it was 12), and, more crucially, serve entrees beyond the traditional Cuban food of roast pork, black beans, rice and plantains. Today, there are paladars popping up all over the city offering cuisine and service to match any restaurant in the Caribbean. The older ones are often quirky in terms of hours and service (they are often family run, with older members cooking and waiting tables). The post-2011 paladars are modern, hip and funky. As for the best cocktail in Havana, it's a toss-up between three of Cuba's famous rum concoctions: the Cuba Libre, the daiquiri and the mojito. The Cuba Libre is basically rum and cola and is rumored to have been created by U.S. Soldiers during the war of independence in 1898. Note that, although Coca-Cola products are not common in Cuba, there is a local "Kola" that is available both in regular and diet versions. The daiquiri is a frozen drink that's made with rum, lime, sugar and maraschino cherries. It was invented by miners in the Cuban port town of Daiquiri. The mojito combines rum with sugar, muddled lime and mint and is served over ice with sparkling water. The most popular local beers are the relatively light Cristal and the stronger Bucanero. Near the cathedral in Old Havana, La Bodeguita del Medio (Calle Empedrado 207; open 11 a.m. to midnight daily), another Hemingway haunt, is regarded as a temple to the mojito and is probably Havana's most famous restaurant. Its walls are covered with photographs, graffiti, drawings and people's signatures (you can add yours if you find space). It's usually crowded and touristy, but it's great fun and definitely worth a visit. While serving up a perfectly tasty drink, these popular Old Havana bars are generally overpriced when it comes to offering fairly average food and mediocre service; El Floridita's entrees range from 35 to45 CUC. La Bodeguita del Medio is more moderately priced, but also serves simple meals. The most popular souvenirs are rum, cigars and coffee, as well as arts and crafts. The most widely available rum is Havana Club, which comes in several varieties. It is recommended that cigars be purchased in reputable shops, as many street vendors try to sell knock-off, low-quality or fake cigars. U.S. citizens are allowed 100 cigars and 1 liter of rum per person to bring back home. Wood carvings, papier mache, musical instruments, items made from shells, paintings and other arts and crafts are available at a number of street markets and shops.